Owned and operated by Matt and Tom Greiner, Greiner Buildings has a long history of being a close knit family company. Recent years have brought us several new members and the trend continues as our customer base grows. The Greiner Family is always looking for motivated individuals who are looking to grow with us and share in our company’s success. We offer each member several benefits including paid vacation, medical, dental and vision insurance, employee purchase program, discounts on products and clothing, and much more. We have Crew Member and Office positions available, including: Sales, Marketing, Project Estimating, IT/Software Development, and Project Management. Click the buttons above to learn more about the requirements for Crew Member & Office positions. We believe strongly in promotion, which can be seen in our leadership team. All of our foremen started as crew members and worked their way to holding the leadership position they now have. If your goals are to be in the office working sales, on the design team, or making estimates, we can help you achieve that. Working with Greiner Buildings isn’t just a job, it is a career that will influence your life and help you to grow individually and as a team member. If you are interested, please Apply Now and email your resume to jobs@gbinc.net. 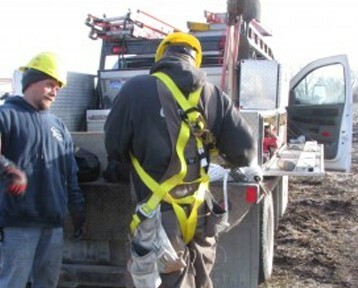 Foreman Damon Sojka takes the time to make sure a new employee is equipped with the correct safety gear and hands out a few words of encouragement and a smile before starting a day of swinging trusses. 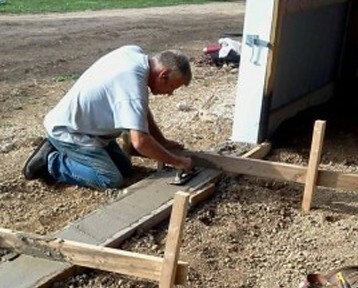 Company founder Tom Greiner enjoys time building with the crew members. Getting away from the hustle and bustle of the office, Tom is frequently seen on the job sites coaching and guiding members to the next level. The Greiner Family takes a break and brings in the whole family for a much needed night out on the lanes. Throughout the year we take time to kick back and relax with BBQ’s or an evening of cards.